We’d love your help. Let us know what’s wrong with this preview of Love, Peace and Soul by Ericka Blount Danois. To ask other readers questions about Love, Peace and Soul, please sign up. 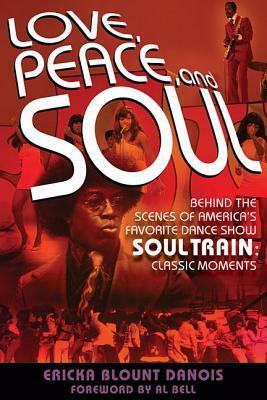 Love , Peace, and Soul: Behind the Scenes of America's Favorite Dance Show Soul Train: Classic Moments by Ericka Blount Danois is a Backbeat Books publication, an imprint of Hal Leonard Corporation. This book is slated for release in Sept. 2013. Ah the memories! I have recently gotten into the performance arts/ entertainment books that have been offered on edelweiss and Netgalley. This one caught my eye on Netgalley and without hesitation, I requested it. Growing up in the seventies, I vividly re Love , Peace, and Soul: Behind the Scenes of America's Favorite Dance Show Soul Train: Classic Moments by Ericka Blount Danois is a Backbeat Books publication, an imprint of Hal Leonard Corporation. This book is slated for release in Sept. 2013. Growing up in the seventies, I vividly remember watching American Bandstand and then immediately following Bandstand was Soul Train. this was a Saturday afternoon ritual for me. I loved the music, first and foremost, but I also loved the clothes, hairstyles, and of course the dancing. Reading this book took me down memory lane and had me grinning ear to ear as I reminisced about the seventies and all that was going on in those days musically. I was too young to realize the impact of a show on an entire country. I just liked watching it. In the late 1970's I had a personal tragedy in my life and was whisked away from my sheltered ,only child, environment. I lost contact with this music and the show and never ever knew the show had been on the air as long as it was. So, there was a great deal about the show, it's background, the heights of it's success and the low points that followed. I had no clue about Don Cornelius's personal life. I did know of his tragic death and was stunned when the news came out. As uplifting as this story is, it was also sad. I had no idea that Soul Train had become a joke to some people. The death of Cornelius wasn't even a blip in the news. But, I'm getting ahead of myself here. The book begins with Don's early life and how he came up with the idea of making a show similar to American Bandstand but with a black host and music played that was featured on the R&B charts as opposed to the top forty music played on Bandstand. The show started out in syndication which gave the show more freedom than shows that were tied exclusively to a specific network. There were not too many people that thought the show would last, even some of the investors were skeptical. But, last it did. The show became one of the longest running syndicated shows on television. Cornelius had a deep baritone voice and was too cool for school. A flashy dresser, a perfect afro, and hip lingo catapulted the show into more and more markets. The music that was successful on the R&B charts began to cross over onto other charts as more and more people were being exposed to the music through the medium of television. The author did exhaustive research on this book. There were a lot of years to cover and the author managed to convey the influence of the show and it's ability to adapt to ever changing times. Soul music, R&B, then disco, then a more mainstream appeal to the beginnings of rap and hip hop. Don Cornelius weathered it all until rap and hip hop came along and he found it difficult to relate. Cornelius's health was also a factor in his decisions to delegate responsibilities later on. His passion and love for his empire began to diminish as people began to use him and his shows as a stepping stone to more mainstream recognition. He was taken advantage of by some of his most trusted business associates and then later in life became a target of jokes and disrespect. In many ways the man was an enigma. He was loved and respected by some, and hated by others. But, that can be said of many successful business owners. A certain distance is often required by those in charge and at times Cornelius seems aloof and cold. Other times he was mean and without tact, and at other times he was funny and charming and seemed to really care about the proper influence and the correct image to portray for greater success. He as a mentor and good friend to many. The author posted a list in the back of the book of the shows and all the guest that appeared, in order. That must have been some task. But, it was so much fun to read off those names. The first episode featured Gladys Knight& the Pips/ Eddie Kendricks/ The Honey Comb/ Bobby Hutton/ and originally aired on October 2, 1971. Frequent guest were Barry White, The Jackson 5, Al Green, The Whispers, Bobby Womack, The O'Jays, and the Chi-lites. There were also athletes that appeared and danced on the show. Bill Russell, Walter Peyton and The Lakers all appeared on the show. The Soul Train dancers were also to become celebrities in their own right. Many were recognizable in public and went on to become successful in other venues. I can't remember having more fun reading a book like this. I went on youtube and looked up videos of the show and had a blast remembering the dances, the trends and most of all the music. Groups and singers I hadn't thought of in years like The Impressions, The Sylvers, The Manhattans, The 5th Dimension, The Trammps, The Dramatics, The Spinners, The Emotions, Teena Marie, Thelma Houston, and The Four Tops, just to name a few. Comedians like Richard Pryor were on the show and a then unknown- Arsenio Hall made an appearance on Soul Train. The bottom line is that this was one of the most influential shows to ever appear on television. A market previously untapped became a massive phenomenon. The many careers this show launched as well as dance trends, hairstyles, clothing styles all helped to catapult the shows success for years and years, even outlasting American Bandstand and many other copycats. Many people enjoying success today have Don Cornelius and his vision to thank for it. An excellent debut from the noted journalist and educator, Ericka Blount Danois, that gives an insightful look at the impact and inner workings of the historic dance show. I was honored by a request from Professor Danois to contribute an afterword about my personal recollections of what it meant to have been a frequent passenger on "the hippest trip in America". You can bet your last money it's all gonna be a stone gas honey. Love, Peace, and Soul is a thoroughly researched book on Soul Train and anything that intersected with the TV show phenom. At heart, though, it's really about Don Cornelius and his struggle and dedication in bringing the show to success and beyond in syndication. I was greatly impressed with the amount of work that clearly went into the book - everything from histories on the dancers, producers, record execs, celebrities, hanger ons, Chicago scene, Los Angeles/Hollywood and more are all represented in stories, quips, and quotes. But at the same time, there are so many tenuous or loose threads that it felt the book lacked a strong chapter by chapter focus and it became hard at times to follow what related to what in the Soul Train universe. I wish there had been more structure rather than semi-connected threads. I would also have liked to see pictures or images - Soul Train was a graphic medium and there are so many names mentioned that I ended up just sitting at my computer with Google open. Soul Train was definitely groundbreaking - for what it represents as well as its success despite the close minded or racist community in which it had to work at the time. It does read very 'us vs them' - which I understand underlies just how amazing it was that a black-centered show succeeded but it also puts a very strong political agenda and subtext on an otherwise fascinating and well researched biography. As well, the books feels hesitant to put any kind of negative face on any of the characters, which again feels like a bias. I grew up loving Don Cornelius. Soul Train was one of the few shows that my mother and I would want to watch together. The unrecognized mentor of hip-hop, Cornelius created a venue for performers and a music style with a large and previously unrepresented demographic. At a time when music and television began to merge, access to black performers was unavailable. Filling this gap was what skyrocketed the show, but the inevitability of the changing music scene began to take over the iconic show qu I grew up loving Don Cornelius. Soul Train was one of the few shows that my mother and I would want to watch together. The unrecognized mentor of hip-hop, Cornelius created a venue for performers and a music style with a large and previously unrepresented demographic. At a time when music and television began to merge, access to black performers was unavailable. Filling this gap was what skyrocketed the show, but the inevitability of the changing music scene began to take over the iconic show quite quickly. Reading about this legendary man and his legendary show reminds us all of the various ways the world has changed in terms of music, race, and those small yet significant occurrences that begin as undersized ripples in the industry, only to quickly become undulating powers that penetrate various unsuspecting industries. Couldn't get much better than finishing up a good book on my first afternoon poolside in Grand Cayman! What a fun trip to go back to the 70's and when Saturdays meant I could indulge my love of R&B / Soul Music by watching each week's production of Soul Train. Amazing the impact that Don Cornelius and his ground-breaking show had on the sucess of African-Americans in the music and entertainment industry. Can't wait to explore YouTube to watch many of the episodes I watched.